News category: Press release - published on 24 September 2018. The ASTERICS collaboration is pleased to announce the symposium: "The New Era of Multi-Messenger Astrophysics" to discuss recent developments in the fields of gravitational waves, astrophysical neutrinos, the highly energetic dynamic sky, and to explore new methods for multi-messenger science and related research infrastructures. The past few years have been pivotal for multi-messenger astrophysics, with the first detection of gravitational waves from the merging of two neutron stars, with follow-up detections at several wavelengths and the recent announcement of a high-energy neutrino event detected by IceCube coincident in direction and time with a gamma-ray flare from a blazar detected by Fermi. Gravitational Wave and Neutrino sources and their electromagnetic counterparts, together with new developments in transient astronomy, are a vibrant field where the nature of many phenomena is still unknown or debated. Furthermore, the generation of new sensitive wide-field instrumentation across the entire electromagnetic and astroparticle spectrum (SKA, CTA, KM3NeT, ELT, Athena) are set to radically change the way we perceive the Universe. In the next decade, space and ground-based detectors will jointly explore the Universe through all its messengers. Adequate e-infrastructures and algorithms are needed to manage and analyse the data. Scientists of all ages are welcome to ask questions and share knowledge. The conference will be held from 25 to 29 March 2019, in Groningen, The Netherlands. It is hosted by the Netherlands Institute for Radio Astronomy (ASTRON) on behalf of ASTERICS. 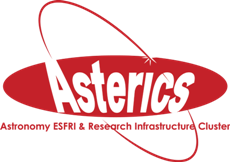 ASTERICS is a Horizon 2020 EC funded project that collects knowledge and experiences from astronomy, astrophysics and particle physics and astroparticle physics and fosters synergies among existing research infrastructures and scientific communities, with the ambition of seeing them interoperate as an integrated, multi-wavelength and multi-messenger facility.